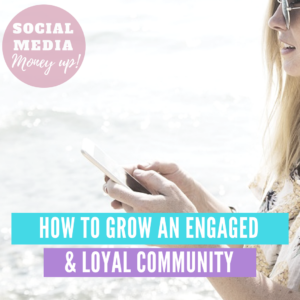 When you are starting on your business or your blog (or pretty much anywhere) you still don’t have a lot of content to be shared on social channels like Pinterest, Twitter or Facebook. 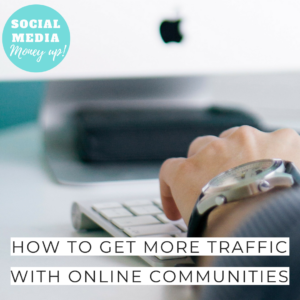 By the way these social channels are the best to drive traffic to your website. In this episode, Angie reveals the steps to follow to generate lots of content from your initial content. Where to find free-to-use professional images. 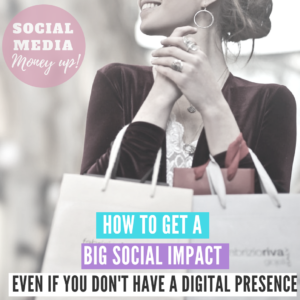 Hello and welcome to Episode 6 of Social Media Money Up. In this episode I will talk about how you can generate content to be shared on your social channels, even when you don’t have a lot of stuff or content to share. 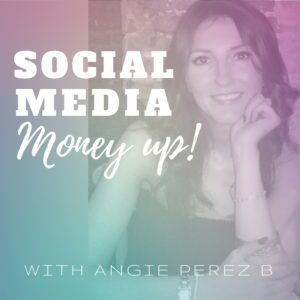 In case we haven’t met before, my name is Angie Perez B, I’m a Social Media Marketing expert and you can find me on Twitter at @Angi9z and on Instagram at @AngiePerez.B. I would like to invite you to my facebook group The Smart Social Income, where you can find ways to drive traffic to your website or social media channels. if you are new to this podcast, please consider subscribing. I record weekly podcast about the best techniques to grow your business or your blog and making money using social media and digital marketing. At the beginning of your digital adventure as a blogger, or with your online business or ecommerce, etc. you don’t have a lot of of stuff to share.You probably only have a couple of blog posts, or just a bunch of items on your ecommerce. Or only a couple of professional services to offer on your online business. At the same time, you need to be consistent on your social media channels and therefore you need to post frequently. It is ok to share behind the scenes, motivational quotes, fun stuff or selfies on Instagram, but lots of other social channels like Pinterest, Twitter or Facebook, don’t quite work like that, and you really want to share the links that drive traffic to your site, your products or your services. So these platforms (TW, PIN and FB) are the ones that really allow you to insert your links and really generate leads for your website. (on the contrary, Instagram doesn’t allow clickable links which makes things so difficult to drive traffic to your website) But your problem right now is that you don’t have a lot of stuff to share (maybe because you have just started). So you also need to solve this point.People with more content, please don’t feel left out. Because this episode is also good for you! (who doesn’t want to have a lot of content to share on social media?) Keep listening! I am going to deploy some step-by-step tips to help you multiply your content. First of all, and to simplify let’s suppose we are talking about blog posts, but you can do the same for your landing page, your ecommerce, your new collection on your online shop, your new promotions on your local business, or your services on your agency or online business. So, First of all we are going to tackle Pinterest. My first recommendation is Canva: You are probably already using Canva (so you know how good it is) but if not, let me tell you Canva is a super easy image editor that I truly recommend because it’s very simple but with professional results for absolute non-techies. If you have an account, you know what I’m talking about, if not sign up for a free account.I will let the links of everything I’m mentioning on this episode on the show notes page at angieperez.b.com/podcast. So once you are in Canva, you need to create different templates for your Pinterest posts. Your pin templates must have the following requirement: dimensions of the images must be within the pinterest images sizes; and you must use you branded colors and your branded fonts. If you don’t know what branded colours or fonts are, let me quickly explain: your brand must be consistent, one of the basics of being consistent is having a cohesive visual style. To create a visual style, you choose 2 colours that you want to represent your brand, and also choose 2 different fonts. Use those colours and fonts on your website, your images, and your social content. So, going back to the pin templates on Canva, create a bunch of templates using your branded colours and fonts. How many templates? You can create as many as you consider, but to start with I will say 4 (but you can create as many as you want). What if you are not very creative or don’t have any idea on how to even start to create any template or any sort of image on Canva? It couldn’t be easier to solve: Go to Pinterest templates and choose from thousands of templates. Chose the ones you like more and just change, adapt and adjust the colours and fonts to your branded colours or fonts. Once you have your templates ready, name them Pinterest Template 1, and so on. Or something along those lines. The idea is to keep those images as your Pinterest templates to be used anytime you want to share anything on Pinterest.Now the second step: decide which link or blog post you are going to share. Now it’s time to look for images that can be used as background for your Pinterest templates. Maybe some of your Pinterest templates don’t need images because their background are solid colours, but if not just find images to be that can be used with the piece of content you want to share. So for example, if you have 5 Pinterest templates, and 2 of them have solid colour backgrounds, you need to come up with 3 images to used as background of your other 3 Pinterest templates. I will leave a link on my show notes about how to sort out about images for your content. Now, the next step: create different titles for your piece of content. This is pretty self explanatory. Let’s say you want to promote your blog post called “Instagram Tips”, so you need to create other titles to be shared on pinterest, like for example: 10 easy steps to grow on Instagram, or how to increase your instagram engagement easily, or discover the best tips to boost your instagram, another example: foolproof techniques to increase your engagement on instagram, etc. I will also leave a link on my show notes at angieperezb.com/podcast about how to create catchy headlines. So, once you have your Pinterest templates, your images and your texts, now you have everything you need to create a batch of 5 different pins for your link! Boom! You have just multiplied by 5 your content! So now, go to Canva, pick one of the templates, and make a copy of it. This is important. My recommendation is to keep the original template with the name (like for example Pinterest Template 01) and work on a copy when you need to create a new pin. Just make sure to change the name of that copy to something meaningful for the pin you are creating. Once you have your five pins created, you can use them on Pinterest, on different days, or boards, etc. Now lets go to generate content for Twitter & Facebook. Here we are just going to talk about Twitter but the same images and texts can be used on Facebook, so therefore the content we are going to create now goes for Twitter and Facebook. So first step, create a few texts for your tweets: must be catchy and within the length allowed on a Twitter. You can again take a look at the link on my show notes about how to create catchy headlines, To see the show notes go to angieperezb.com/podcast. I would say, you can create maybe 7 (you can create as many as you want, but I would suggest 7 if you are just starting). Now let’s go back to Canva and follow the same steps as we did with our Pinterest templates. This time we are going to create 7 Twitter templates. Again, if you don’t know how to create or your creativity is not very good, go ahead and choose from lots of Twitter templates available on Canva. Don’t forget to adapt and adjust colours and fonts to your branded colours and fonts. I would create 5 Twitter Canva templates, and maybe the other 3 texts can go with maybe a GIF image or plain images without text. The size of Twitter images work very well on Facebook, so all this material (texts and images) you can use them on your Facebook posts.So now, you have a bunch of pins, tweets and facebook posts for your one and only link! You not only multiply your content, but also multiply the chances to drive traffic to your site! If you want to know how to grow on Twitter, don’t forget to download my free mini ebook “How To Increase Your Engagement On Twitter” available on my website angieperezb.com In any case, I will leave the direct link to the free eBook on the show notes on my website at angieperezb.com/podcast See you in the next episode of Social Media Money Up! Happy Socializing! !